Clean Coalition is on a mission to alter transmission access charges that the organization says unfairly boost the cost of local renewable energy and community microgrids in California. Eliminating the charges for locally produced renewables would lower the cost of renewable energy and microgrids, paving the way for more of both, says Craig Lewis, executive director. Clean Coalition’s overarching goal is to establish a network of community microgrids, as opposed to single, behind-the-meter microgrids. A network of community microgrids would be incorporated into the existing grid infrastructure. 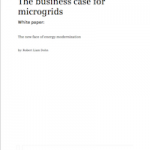 “In its most comprehensive form, the community microgrid covers the grid area served by a single substation and the handful of feeders that come out of that substation,” he explains. The organization is working to address a number of policy, regulatory and pricing issues that make it difficult to meet this goal. One of Clean Coalition’s top priorities is changing the transmission access charges, which it says are unfair because locally produced solar, wind and other renewables don’t use the transmission system. “The transmission access charges are worth an average of 3 cents/kWh. This is a massive highjacking or stealing from distributed energy resources and is causing a market distortion,” he says. The California Independent System Operator (CAISO) assesses the charges and bills them to the utilities, which then bill customers, explains Rosana Francescato, communications director, Clean Coalition. 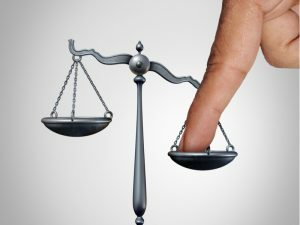 The charges are assessed in different ways depending on whether a utility is a participating transmission owner — like the investor-owned utilities. However, most of the municipal utilities in California are not participating transmission owners. CAISO properly assesses the charges to municipalities, she says. For municipal utilities, the charges are metered and assessed at the transmission-to-distribution grid interface, at the transmission substation. Using this system, it’s possible to determine whether energy is coming from afar or from local sources. And that’s how the charges should also be assessed in the investor owned utility territories, Lewis says. A spokesman for Southern California Edison said that the company took part in a recent CAISO stakeholder process regarding transmission charges. The company “strongly believes that all customers on the distribution system receive benefits from the transmission grid and should therefore pay for the transmission grid,” the spokesman said. CAISO in September developed a proposal which, if approved by the CAISO board, would be filed with FERC. 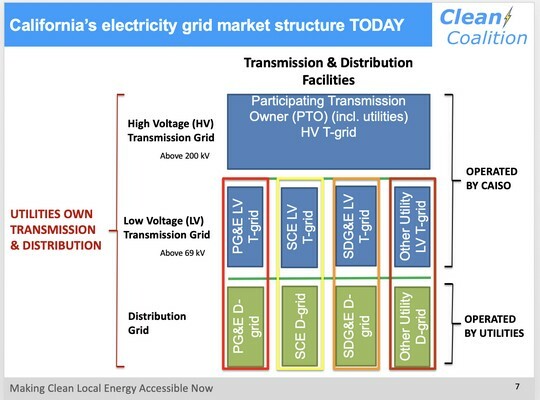 Moving the point of measurement, for the purpose of determining transmission charges, would shift the embedded costs of the transmission grid to areas that don’t have distributed generation to serve a “comparable” portion of their load, according to CAISO. “Such retail rate design changes are outside of the purview of the ISO and this stakeholder initiative,” CAISO said. Clean Coalition supports CAISO’s call to the state regulators, especially the California Public Utilities Commission, to review all cost allocation mechanisms, including the CAISO tariff, the investor owned utilities’ tariffs, and any retail rates or other mechanisms, says Francescato. Without the transmission access charges, more renewable energy and storage would be developed, Lewis says. Additional demand response would be added, and less transmission would be needed. In fact, Clean Coalition estimates that ratepayers would save $60 billion over the next 20 years from avoided investments in transmission infrastructure and associated operation and maintenance costs. This figure is based on the assumption that 75% of planned transmission could be avoided. Clean Coalition believes that California can move to 100% renewables, with 25% coming from local renewable energy and 75% coming from remote sources. In its efforts to bring more renewable energy online, the organization is also developing three behind-the-meter, renewables-based community microgrids through its Montecito Community Microgrid Initiative. One goal is to create community microgrids that are “community microgrid ready,” which means that when the utility is ready to partner in the project, it will be possible to use the utility grid. At this point, the organization has not convinced Southern California Edison to participate in the project, says Lewis. “Those three sites will have behind the meter microgrids for now; that’s the only thing we can do due to existing rules,” says Lewis. “Community microgrid ready” means the microgrids can communicate with the utility via the utility’s standards. “We’re going to make our best guess, but will also have hardware in place that’s flexible. If we need another standard, the hardware can manage that,” he says. Learn more about community microgrids during Craig Lewis’ May 15 presentation at Microgrid 2019 in San Diego. Meanwhile, the organization is also working to establish resilience values for microgrids. Changing transmission access charges would allow the economics of community microgrids to improve significantly, Lewis says.